It's high time I wrote an update on my lovely little shop, Moth Crafts in Bungay. Since Dorcas, the friend who started it with me, started working full time in her children's school, I've made some changes and now stock some lovely yarns and a range of craft materials. Knitting, crochet and papercraft are not my crafts, but like a magpie I'm attracted to all of the pretty colours and textures! Still not knitting or crocheting (despite one of our makers holding some crochet classes in the shop) but I have discovered I love using the dye cutter and cutting out shapes in paper. These felt butterfly hangings were great fun to make. I did think about selling beads - but with my passion for semiprecious stones and for beadwork I would want to fill the whole shop, just with stones and beads. And I would be forever 'borrowing" from the stock. Besides - it is not just my jewellery customers come to the shop for - we have around 30 makers from Norfolk and Suffolk here, all making beautiful things. We have pictures made from polished pebbles, needlefelted creatures, decoupaged things, ceramic things, fused glass things, fantastical figurines, hand-dyed silk scarves - all sorts. And chocolate. We have chocolate! After over four years running my shop I've now handed over the reins to Andrew Morling. 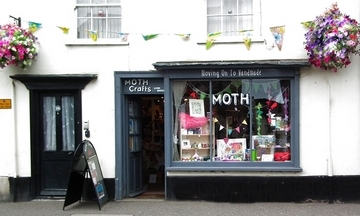 Andrew already has a little gift shop in Bungay, Ere We Bee Crafts and is delighted to also now have Moth. My jewellery is still available in the shop and I am working there one day a week to help him out - and to keep up with Moth's lovely customers and talented makers!